Dhara Avonlea is her name. (Pronounced “dar-uh avon-lee.”) And she is just the sweetest little baby girl. Dhara was due on Christmas Eve, but decided to make her appearance early on Christmas morning at 4:13 AM — probably the best Christmas present we’ll ever get in our lifetime! Weighing in at 9.1 pounds and 21.75 inches long, our little cupcake took a while to come due to her cupcakiness! Due to a high level of jaundice, we have been in the hospital with Dhara since her birth day last Thursday, Christmas Day. She is constantly under light therapy, therefore making it impossible to hold her very much. By God’s supernatural grace and healing power, please pray that these levels would come down so that we can take her home. She’s super cuddly, and we want her to be home — safe, sound and warm in daddy and mommy’s arms. Project #2: Shawl Collar Sweater. I have always been one for a nice, thick, comfy sweater. The kind that reminds you of fall leaves and winter snow. The kind you wrap yourself in for a woodsy bonfire. Shawl collar sweaters are especially nice for this. I have a few myself, and thought that my little girl would like to feel as cozy as I feel when I’m in them. This baby sweater in peacock blue is a comfy addition to any baby girl’s wardrobe. I used Debbie Bliss’ Ribbed Baby Jacket pattern in size 0-3 months found via Ravelry. As for yarn, I used a beautiful skein of Manos del Urugu’ay yarn to knit this sweater. The yarn has got a folksy handspun pure wool kettle dyed finish. The finished sweater has got cuffed sleeves and a big brown button for kicks. Baby clothes don’t have to be so baby anymore. When choosing the yarn for this sweater, I remember walking into the yarn shop with a specific type of yarn in mind. I told the lady behind the counter that I wanted to make a baby sweater, and she directed me to all the “baby yarns” in baby yellows, pinks and light purples. I shook my head. “Nope, this is not what I had in mind.” I walked over to the bins of Manos yarn and instantly fell in love. She disagreed with my selection for a baby sweater, but I bought 2 skeins anyway. I love how warm this sweater makes me feel inside. Makes me think of a log cabin and warm banana bread. Thanks to Lakshmi for her help with the pattern! What is Baby Smith Handmade? I’ve been meaning to post photos of Baby Smith Handmade projects, but got so wrapped up in preparing for baby, that I’ve not had time to put the finishing touches on these projects. But this past weekend’s blizzard was a much needed time to spend on completing them. Project #1: Scalloped Quilted Blanket. This blanket is oh, so cozy. Two pieces of thin flannel sewed together to make a baby blanket that could work for all seasons. I loved the striping on the fabric — it reminds me of the 70’s for some reason. The quilting really makes this simple blanket into something special, I think. And to top it off, back in September, Greg gifted me with my own custom-made susie mey clothing labels for finishing my Berean coursework on time! Crafted and woven in Great Britain, these labels are so fantastic — they make sewing much more fun because you get to personalize what you’ve made. I’ve always wanted to start my own children’s line…maybe one day I’ll get the chance. Behold are some darling little shoes from Ivory + Moss. They’ve got a great selection of natural and eco-friendly baby shoes. While I was on the subject of gifts, I thought I’d share about these folksy little shoes that my sister got for the baby. I just love things that are folksy, warm, and cozy — not to mention shoes that are warm and folksy! Give me that any day! These handmade ‘Little Lamb Mary Janes’ are made of a natural felted wool, a faux leather vegan sole, and a wooden button closure. Just darling! Thanks Beckster! A perfect match with this organic cotton kimono sweater from Nature Baby. It’s got that great feel of soft Indian cotton. So comfy and so, so sweet. Greg’s parents gifted Baby Girl Smith with a very thoughtful present — a beautiful armoire. They wanted to give her something she could grow with and take with her when she leaves our home for a home of her own. This armoire is truly fantastic. We came across it in a neat store in downtown Baltimore. It is an antique piece from the British/Indian rule. The owner of the store, a humanitarian lawyer, purchased it from Rajasthan in North India and says that the armoire is about 110 years old. Made from teak wood and about 7 feet tall — this is a true wardobe in every sense of the word — it was such a beast to get home (so very heavy)! It reminds me of the armoire/wardrobe in the Chronicles of Narnia — just not as deep. : ) Thanks Dad and Mom for such a precious gift — we’re pretty sure it will be a very special piece for Baby Smith all her life! It’s so crazy to think that I am a mere 2 weeks away from my Christmas Eve due date. Today I am 38 weeks! My baby is as long as a leek! Last evening at our midwife visit, Kathy said that it could happen anytime from now till the due date, or a little after. I certainly can feel that the baby has dropped because I’m going to the bathroom almost every hour and it’s getting harder to walk. Our bags (and the baby’s bag from Aunt Beth!) are packed, and the car seat is going in the car tonight. Exciting stuff. “Your baby has really plumped up. She weighs about 7.5 pounds and she’s over 19 1/2 inches long. She has a firm grasp, which you’ll soon be able to test when you hold her hand for the first time! Her organs have matured and are ready for life outside the womb. As some of you know from a previous post, we’ve been on the lookout for a high chair. Specifically the scandinavian svan high chair. Regularly priced — it is totally out of our price range. But craigslist priced, we can so do. And that we did! I just picked up a svan for less than half the price! The neat thing about this high chair is that you get a lifetime of use out of it. 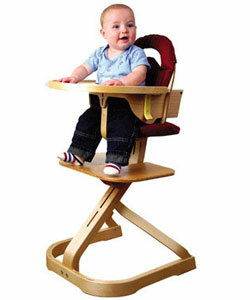 It transitions from a baby high chair, to a toddler high chair, to a regular chair for an adult. Talk about efficient. Talk about trusting too. The lady who sold the high chair to me had something unexpectedly come up, so she could not be home when I came by for the high chair. But she called me up and said that she would leave the high chair in front of her garage, and that I could leave the money in a cooler located near her front foor. I was very surprised by her level of trust. Very few people like that nowadays. cloth diapering: prefolds + washing. I started on the cloth diapers today. The cloth diapers get their own load because they are best washed with detergents that are free of enzymes, fabric softner, brightners, scents and dyes. After doing much research, I chose to go with a Canadian brand detergent called Country Save. It’s supposedly awesome for maintaining long lasting cloth diapers. Thanks Cynthia for your really helpful link on recommended detergents for cloth diapering!!! As for my cloth diapering choice (there are many to choose from! ), we are going simple with the prefold + diaper cover system. I purchased 3 dozen unbleached, infant sized, Indian prefolds from a company in Vermont called, Green Mountain Diapers. I found them to have quality goods and at an afforable price at 1 dozen prefolds for $21.00. We also purchased 6 gDiaper covers for our choice of covers (there are so many cover options as well, but we found a great deal on the gDiaper covers). Brand new Indian prefolds have to be washed 4-6 times before they can be used. They are on their 3rd round right now. Two more to go!